Some of you may have seen my comments quoted in a couple of Adweek posts, on September 11 and 30, about the Washington Redskins controversy. Basically, I said that while I understand how passionately the fans hold on to their traditions, the phenomenon of racial epithets and stereotypes in sports logos is ultimately doomed. 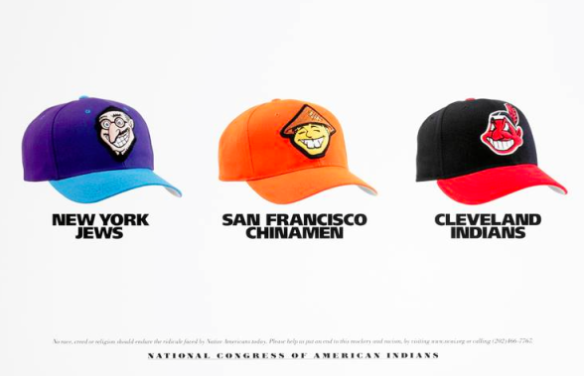 "Pro-Football's use of the 'Redskins' mark disparages Native Americans just as 'San Francisco Chinks', 'New York Jews', 'Dallas Wetbacks', 'Houston Greasers' and the 'Green Bay Crackers' would disparage other groups if they were the subject of trademark registrations," states a legal brief sent by the NCAI to the US Supreme Court. They're asking that the "Redskins" trademark be rescinded. This mysterious poster, however, doesn't seem to appear on the NCAI site, even though it has been attributed to the organization by CBS news. All references to it, however, seem to use the same low-res screenshot posted on Tumblr, four years ago. Due to the recent re-emergence of the issue around the Washington Redskins, however, it has gained new life on the social internet. Can anyone find the original source?